A lot is happening in our community right now in support of Zero Waste. From Missoula classrooms to the Montana Legislature, people are stepping up as local heroes of the Zero Waste movement. Who are these heroic individuals? They are school teachers, parents and local business owners. They are grade-schoolers, university students and our elected officials. They are institutions like the Missoula Federal Credit Union, which has committed to aligning its operations with the ZERO by FIFTY goal. They are everyday Missoulians who care about the future and are taking action to make it more sustainable for everyone. Many of these folks are members of Zero Waste Missoula, a grassroots coalition formed in 2015 to support Missoula’s move toward Zero Waste. The passionate people of this coalition are identifying opportunities and taking action to engage in a number of ways to continue the group’s mission. Most recently, Zero Waste Missoulians participated in the Downtown Master Planning process to advocate for the adoption of the ZERO by FIFTY goals and actions into the vision for the next 20 years of development in our downtown. 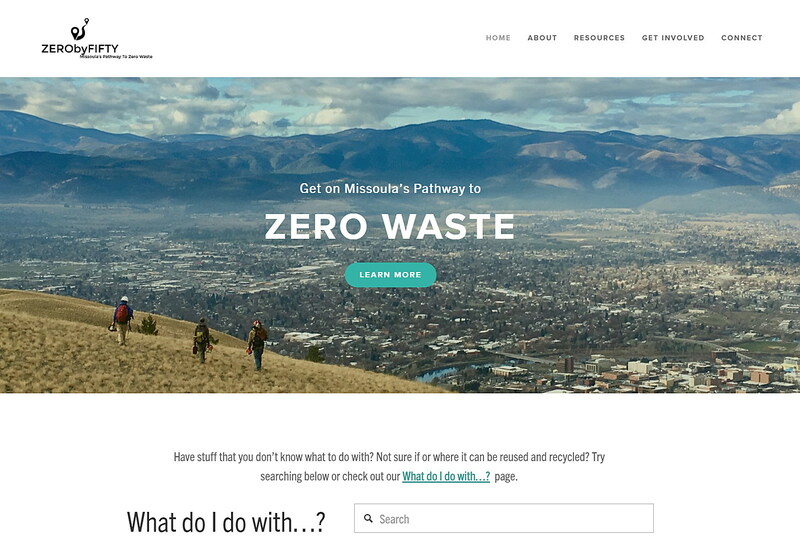 Zero Waste Missoulians are also helping develop a ZERO by FIFTY website, a one-stop-shop for all things “Zero Waste” in Missoula, which is coming soon. Working Toward Plastic Free in Montana is a group of concerned citizens affiliated with Zero Waste Missoula. From high-schoolers to retirees, these intergenerational heroes are seeking ways to educate about the ill effects of plastic on planetary and human health and to identify strategies to move beyond plastic in our daily lives. Here at Home ReSource, we are gearing up for our fourth year of ZWAP!, our Zero Waste Ambassadors Program for fifth-graders. New this year, we’re piloting a landfill field trip component as a way to really ground students’ learning about our planet’s resources in the reality of our community’s waste. We are also working with the Missoula County Public Schools sixth-grade science team to develop a classroom ZWAP! unit, which will be a deeper dive into the topics introduced in the fifth-grade ZWAP! lessons. In Helena, the Montana Legislature is considering bills in line with the ZERO by FIFTY recommended actions. The legislative session only comes around every two years, so this is a meaningful moment to make broad and lasting change happen. House Bill No. 165 – Introduced by Rep. Marilyn Marler (D-Missoula) HD 90, this bill calls for a statewide phaseout of the use of expanded polystyrene packaging, aka Styrofoam, in food service establishments and by food packagers beginning in January 2022. Senate Bill No. 120 – Introduced by Sen. Sue Malek (D-Missoula) SD 46, this bill would limit restaurant distribution of plastic straws unless requested. Malek drafted this bill after she received a letter from first-graders at Sussex School in Missoula who voiced their concerns over plastic pollution. Senate Bill No. 121 – Also introduced by Senator Malek, this bill would establish a fee for disposable carryout bags. This bill proposes that the fees collected would establish a statewide grant fund to support waste reduction or recycling efforts. These examples are only a taste of the energy, passion and heart that your fellow Missoulians are demonstrating in our collective pursuit of achieving a Zero Waste community. Join Zero Waste Missoula – The next meeting of Zero Waste Missoula is Thursday, January 24 from 3:30 to 5 p.m. in the Home ReSource Community Room. All those interested are welcome. RSVP to Noelle, noelle@homeresource.org. Stay tuned for launch of the ZERO by FIFTY website – coming soon. Support ZERO by FIFTY-aligned legislation – Want to voice your support for proposed legislation but don’t know where to start? Get support from the amazing folks at the Civic Action Work Party every Wednesday from 6 to 8 p.m. at Imagine Nation Brewing. Also, invite your friends across the state to voice their support, too. Thank your children’s teachers for bringing the ZWAP! experience to their classrooms or encourage those who haven’t yet to do so. Our Zero Waste Ambassadors Program is currently reaching roughly 70 percent of fifth-grade classrooms in the Missoula County Public Schools. We know that to shift our culture toward Zero Waste, every young Missoulian needs the knowledge and skills to make empowered choices for a sustainable future. We believe ZWAP! is helping make that happen. For more information about ZWAP! contact Noelle, noelle@homeresource.org. Jeremy Drake is Community Engagement Manager at Home ReSource. January 23. Clean Power for All Rally in Helena. Join Northern Plains Resource Council, 350 Montana, and others in speaking up for creating good jobs and a more sustainable future for Montana with clean energy. State Capitol Building. 12 – 1 p.m.
January 28. UM Recycling Committee meets to discuss how to reduce waste at UM through education, procurement practices, etc. All welcome. UM Facilties Services Room 101. 2 – 3 p.m.
January 28. Climate Action Collective meets. UM’s University Center room 207. All welcome. For info, contact Dan. daniel.carlino@umconnect.umt.edu. The next meeting is on Feb. 11. January 28. Missoula’s Mayor Proclamation supporting a U.S. constitutional amendment that says corporations are not people and campaign contributions are not protected free speech. Citizens are invited to express their views. Missoula City Council Chambers, 140 W. Pine. 7 p.m.
January 30. Faith & Climate Action MT meets to plan actions for the MT Legislature. All welcome. Emmaus House, 532 University Ave. 12 – 1 p.m.
January 31. Environmental Issues in the 2019 MT Legislature. Montana Environmental Information Center provides a preview of key issues. All welcome. Goodworks Ventures, 129 W. Alder. 6:30 – 8:30 p.m. Free. February 14 & March 14. Climate Smart Missoula’s Monthly Meet-Ups. February’s topic is Transportation & Smart Growth. March’s topic is Zero Waste. Imagine Nation Brewing from 5 – 7 p.m.